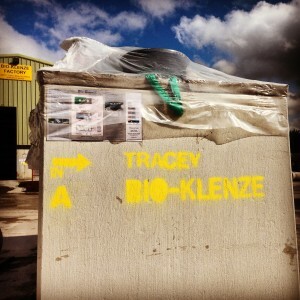 The Bio-Klenze tank is manufactured in Tracey Concretes BS EN ISO 9000 accredited production facility, which also incorporates a UKAS approved concrete testing laboratory. The Bio-Klenze product is manufactured in this high quality production environment along with other concrete products that carry the British Standard Kitemark. The tank is manufactured using 60N/mm² concrete incorporating steel reinforcement. The tanks are manufactured in a monolithic single pour production process hence there are no joins in the tank structure increasing its structural strength and assuring 100% water tightness. The finished concrete is impervious to sewage, giving an expected design life in excess of 50 years. Based on the principle of quality before expense the ancillary treatment unit is also assembled in Tracey Concrete’s production facility. All the materials, parts components are sourced from reputable suppliers. Tracey Concrete’s renowned reputation for quality and performance is based on providing the very best in customer satisfaction.